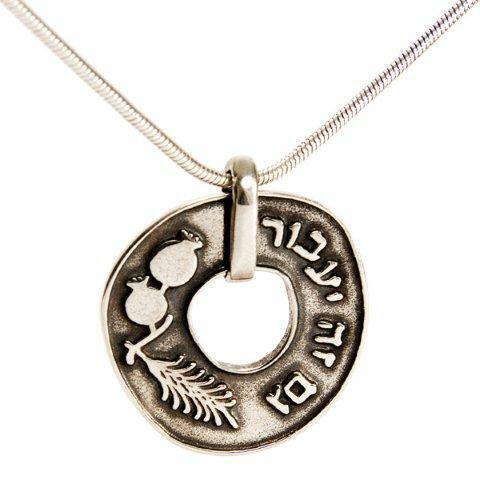 This round Sterling silver Kabbalah amulet is designed to give relief from the stresses of life. One simple piece of silver jewelry to help you ease the feelings of pressure from day to day tensions in life. This amulet in sterling silver is made in a circle. Both the outer and the inner perimeters are narrow bands of smooth silver. Between these two circles you find a wider band of silver, in changing shades of silver -from very dark around the carved symbols, going to light in the unadorned areas. It is carved with a relief of a stalk of wheat and two pomegranates. The wheat and the pomegranate are two of the seven species which symbolize the Land of Israel. On the right you'll find a very simple phrase - but very meaningful: 'Gam Zeh Ya'avor' in Hebrew, which means 'This too shall pass'. Just as the land gives grain and fruit after it seems barren and bare, one must have faith even in times of pressure or stress that they shall pass, and indeed serve as a stepping stone or catalyst to personal improvement. The whole circle is enclosed by a smooth sterling silver loop which anchors it securely to a sterling silver necklace. This amulet by Ma'ase B'Omanut Jewelers has a diameter of 1 inch (25mm).